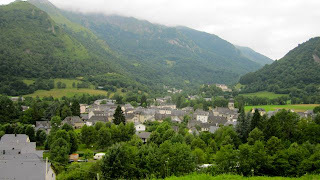 Stage 12 Cugnaux to Luz Ardiden. Now the fun has begun, the General Classification contenders should now come out to play. 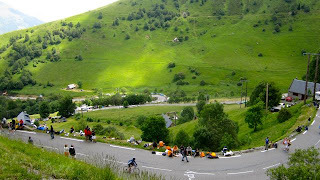 Luz Ardiden was the first stage with some real hills, the Cat 1 d'Ancizan, followed by the Hors Cat beasts Tourmalet and Luz Ardiden. 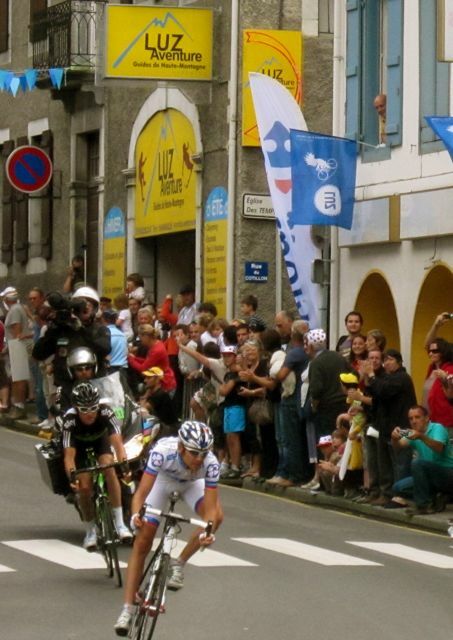 A great victory for Sammy Sanchez, much to the delight of the huge contingent of Basques on the climbs. Cadel had a solid day and looked comfortable; more comfortable than Contador but not as comfortable as the brothers Schleck! They really had their act together and did a great job of taking valuable seconds of Cadel and Contador with their two man slam. 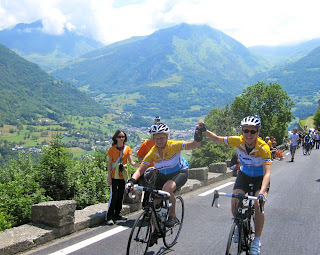 Our Tour group transferred from Toulouse to Lourdes by bus and were on the bikes by 10.30 and heading up to Luz Ardiden. It was a great relief to leave the rain behind and have the chance to ride this great climb in sunshine, although the clouds came in with a cold change later in the day. 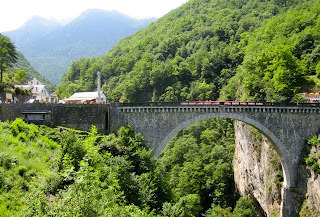 A magnificent bridge across the gorge at Luz St Sauveur just before the climb of Luz Ardiden begins. The switchbacks on Luz Ardiden, looking down from the 2 km to go banner. Raelene and Ros on the way up the beautiful Luz climb, celebrating the moment! 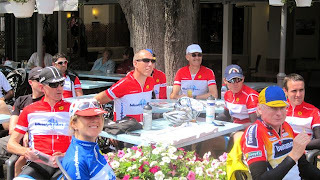 It was getting chilly on the mountain so this group of warriors decided the sunny cafe at Luz St Sauveur was a more pleasant option....... and the chance to watch the race on the Big Screen and see the riders go through after descending Tourmalet. Another big day in the Pyrenees and the riders enjoyed another glorious summer's day in the mountains, although believe me you need a few extra layers on for the descents as the wind chill is up there. A couple of baby Cat 3 & 4 climbs early in the race to sort the wheat from the chaff, then it was up the mighty HC Aubisque before running over to Soulor and then the big descent into Argeles Gazost before the flat run into Lourdes. 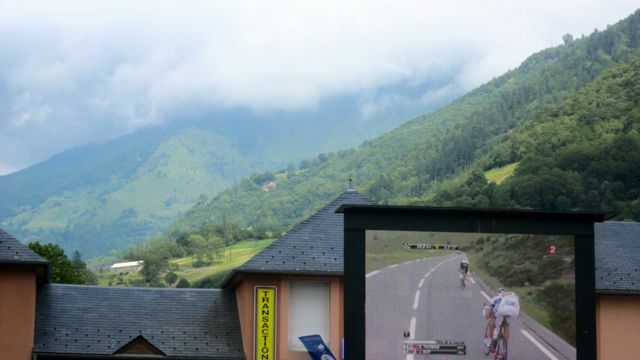 Great to see Jeremy Roy's two brave days rewarded with the Polka Dot Jersey, he seems to be a great talent and the French have big wraps on him and he gave his fans two great days of attacking riding to take on the field alone, only to be picked up in the closing stages each day. However, that great effort aside, how good was it to see Thor Hushovd ride down David Moncoutie on the descent of Soulor and then ride away from him in the chase to Jeremy Roy to take the rainbow jersey to the line in a fabulous victory. Our tour group rode up to Soulor and then Aubisque and then returned to Lourdes to watch the finish of the race. The ride was absolutely beautiful, as you can see by the photos below. The town of Arrens at the foot of the Soulor climb. Andrew 1.5km from the summit of Soulor, how good is this for a view!! Andrew & Pete at the summit of Soulor. Great riding Andrew, you earned that coffee!! Now here's a character for you. 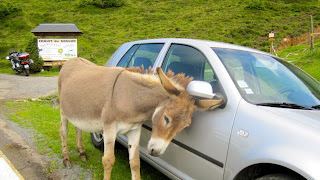 This ol' fella was giving his head a scratch on the wing mirror of a car when Andrew and I were approaching the 2 Km to go mark, so I just had to take a shot.....and then he stopped scratching.......looked at me and had a great big chuckle! Pete, I think you all gave us a chuckle with the donkey hee haw! love all the pickies and commentary! Awesome scenery the last two nights over the Pyrenees but so weary, tonight to bed early, & watch tape tomorrow night. 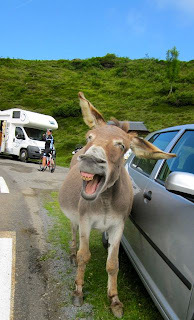 Rob sends big hi and dad too, all well, both dont know how to comment but read your blog as well. Hi Pen, Paige, Courts, Shaz, D&G & others who are following the blog. Great to share the fun with you all. Had a great day on Tourmalet today, 100 km round trip and 45 km of climbing to 2115 metres. A little leg weary but home in the hotel watching the finishing 50 km of today's stage. 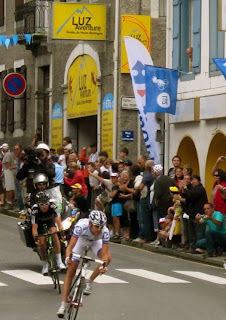 Got some great shots on Tourmalet today for tonight's blog post. 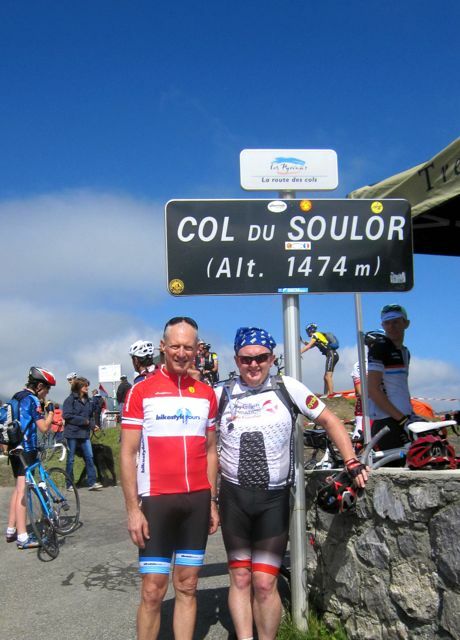 Pete, our trip up tourmalet was just a dream come true - still feels sureal! Thanks so much for all the encouragement. Some great shots posted here too. Keep up the great blogging.